Justin started Kearney Moving in 1996. His passion to serve people is founded in his faith in Jesus Christ. Justin's is married and is the proud father of 3 children. Since 2017 he has been battling terminal brain cancer. Through this challenge he enjoys encouraging others who are struggling with sickness or loss. Justin is also an entrepreneur, he has a degree in accomplished musician and serves as a worship leader at his church. Roger has been a part of Kearney Moving since 2010. He is a husband and father of four. In his spare time, Roger enjoys going hunting and fishing. Our customers always appreciate his servant's heart and willingness to answer any questions they might have. Brent joined the Kearney Moving team in 2018. With extensive experience in business, finance, and management he plays a vital role in the daily operations of the company. Our customer's and employees really appreciate Brent's easy going personality and desire to serve. When he isn't working, Brent enjoys spending time with his family and serving at his church. When you call our office, you will likely talk to Jo first. Her upbeat attitude and fun loving spirit make her the friendliest receptionist in the business. Jo has been a part of the team since 2011. When she isn't working, Jo enjoys spending time with her family. Kellie Whitcomb - Customer Service Rep.
Kellie joined the Kearney Moving team in 2018. With over 15 years of experience in the moving industry she serves our customers by preparing estimates and helping them get everything ready for moving day. Her fun loving personality and desire to serve puts our customers at ease. When she is not at work she love spending time with her kids and grandkids! Bill joined the Kearney Moving team in 2013. As the lead foreman he plays a vital role in training our movers and drivers. His solid work ethic and attention to detail keeps customers bragging about Kearney Moving! He may not look like it but this guy is a proud grandpa! When he's not working Bill loves spending time with his family and serving in his church. 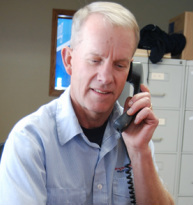 Dan is a former co-owner of Kearney Moving with over 20 years in the moving industry. In his spare time, Dan enjoys restoring classic cars and visiting his grand kids. Our customers regularly comment on how much they enjoy Dan's knowledgeable and easy going personality. Sam has been a part of the Kearney Moving team since 2007. As a former military man, Sam has set the standard for quality for our employees. His balance of humor and hard work has helped our customers learn that moving can actually be a pleasant experience. When Sam isn't working, he enjoys spending time with his family.